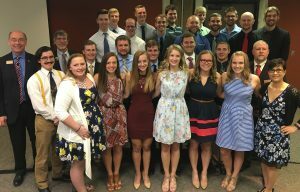 More than 120 graduates were recognized during the ISU CCEE Spring 2017 Pre-Commencement Celebration. The celebration, held on Saturday morning at the Iowa State Center Scheman Building, commended the success of the graduating class. Both civil and construction engineering graduates were honored during the event. 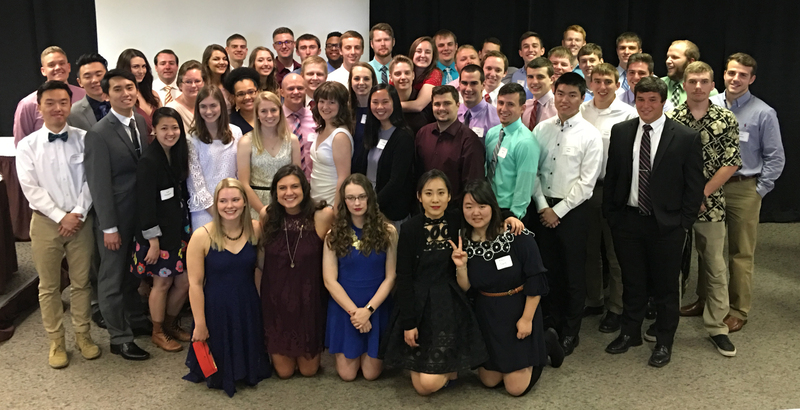 Each student present spoke about his or her Iowa State experience, shared memories and thanked faculty, family members and friends for support. Each semester, two students who bring the most family members to the pre-commencement events are recognized with the Family Enthusiasm Award. One civil engineering graduate and one construction engineering graduate are chosen. This semester, construction engineering graduate Ashley Wickett (who duel-majored in both construction and civil engineering) took home the prize. She had 17 family members present at the ceremony. There was a tie between civil engineering student Glenna Lovig and Lane Heinlein, who each brought 12 family members. In all, the CCEE department had 90 civil engineering graduates and 33 construction engineering graduates. Lovig and construction engineering graduate Blake Gethmann were chosen as outstanding seniors for the College of Engineering. Take a look at our Facebook and Twitter for more on graduation.